National Bakery School graduate, Nathan Giles, who started out in life wanting to be a builder, has been given The Rising Star Award at the Baking Industry Awards 2015 – the industry’s equivalent of the Oscars. Nathan Giles, who currently works as a New Product Development Technologist with the UK’s largest organic baker, Nicholas & Harris, beat off stiff competition from the upper crust of the British baking industry to claim the top award which recognises emerging talent. The Rising Star Award is open to entrants of all ages, but is aimed at those in work, studies or training who are able to demonstrate their bakery achievements during the past three years. Nathan, 29, graduated from the National Bakery School in 2012 after completing a BSc (Hons) in Baking Technology Management. He then went on to work as a research associate on a knowledge transfer partnership (KTP) between London South Bank University (LSBU) and Mr Bagels Limited, a food manufacturer for major retailers and wholesalers in the UK and other European countries. Through the KTP, he helped alleviate problems in bagel production, such as new product development protocols and quality control. 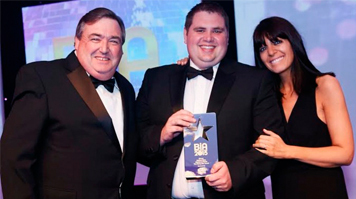 The award was presented to Nathan by television personality and star of BBC’s Strictly Come Dancing, Claudia Winkleman, and Mike Holling, Executive Director of the award’s sponsor, Craft Bakers Association. More than 800 industry guests recognised Nathan’s achievements at the gala awards ceremony held at London’s Park Lane Hilton. Nathan’s earlier plan of a career in construction was quickly abandoned after starting a job at a Sainsbury’s bakery. “I was definitely bitten by the baking bug whilst working in Sainsbury’s. This led me take up an opportunity at a small bakery called The Bakery in Bexleyheath. Now in its 28th year, the annual Baking Industry Awards are the premier event in the UK bakery calendar and have been recognising industry excellence since 1987. Run by British Baker magazine, prizes are awarded across 11 categories including Speciality Bread Product, Celebration Cake Business and Bakery Manufacturer of the Year.